Mhumhi ate the cubes, one at a time, from the bowl, feeling their lying surfaces collapse under his premolars. He kept his eyes on Henli as he did so, eating and eating, though his belly was already fuller than was comfortable. Henli was looking back at him, but she did not seem uncomfortable; rather, she kept that tired smile. For some reason this made Mhumhi feel sour. Tareq had not touched the cubes, despite Kutta’s cajoling. He stayed pressed against her side on the couch, curling his knees to his chest, one thin wrist crooked over her neck. “I want the nice yellers,” he told her. “The… who?” Kutta said, wagging her tail a little. “Nice yellers,” Tareq repeated, and pointed at the door. They could hear movement behind it- the screamers were all still crouched outside in the hallway. Tareq frowned and retracted his hand at once. Mhumhi felt a pang. There was a little of Maha in his stubborn expression. He stopped eating, licking his lips. His jaws felt gummed together. “What now,” he said, directing the question to the whole room. Kutta turned to look at him, with her pockmarked muzzle, and Henli put her chin in one hand and said nothing. Tareq said, “Let’s go see the yellers,” and then jammed his thumb in his mouth in an irritated way, as if he knew nobody was going to take him seriously. “There you’d be wrong,” said Kutta. Because you were all in such a hurry to die, thought Mhumhi, but he couldn’t quite bring himself to say it out loud. He paced the length of the small table a few times. Kutta rested her chin on Tareq’s shoulder a moment, watching Henli over his back. Henli’s smile thinned a bit, but she merely shrugged again. Henli’s smile thinned even more, but before she could say anything, there was a loud rustling from the next couch over. O had pushed herself up onto her forearms, blinking slowly. For a moment her posture and languid eyes reminded Mhumhi oddly of Hlolwa, the madame of the painted dogs. O blinked a few more times, her arms quivering a little from the strain, and then pushed herself back against the couch into a slouching seated position. She looked at Mhumhi from under her eyelashes. O gave a small, wavering smile, still looking at Mhumhi. He had to break the gaze first, feeling oddly embarrassed. “That’s my dog,” said Tareq. Mhumhi saw Kutta flinch as his little fingers dug jealously into her fur. O laughed, one hand hovering in front of her mouth. Mhumhi put his ears back, but there was nothing false about the sound. “You sound like you think they deserve it,” said Kutta. Mhumhi swallowed. The first sight he’d had of Lamya flashed in his mind’s eye: a hulking monster, dragging a bloodied coyote by the leg. Yet somehow, Henli’s disgusted expression made him feel just as sick, his stomach churning. He could see discomfort in Kutta’s expression as well. “My dog was my kind,” said O. They all looked at her, for her tone had been unexpectedly lucid, even though she was still swaying a little in place where she sat on the couch. “I would have died for her,” she continued, casting her eyes down. “We were all willing,” said Henli, looking at her with a kind of syrupy sympathy. Mhumhi felt gummy bile in his throat. “But you’re still here,” he pointed out. Henli looked at him again. “Other humans, you mean,” said Kutta. Mhumhi pondered this for a moment. “Ah, cows?” Kutta shot Mhumhi a nervous look. “How many of you are there in this building?” asked Kutta, seeming pressed to get the subject off cows. Mhumhi realized O hadn’t spoken up for quite a while. She was sitting slumped against the couch, looking hazy. “Why so many?” asked Kutta. “For our knowledge,” said Henli. “Our technical skills. Whatever the best this city had to offer was, we wanted to preserve it. Even O here…” She smiled a little at O, who paused in her swaying to look back at her. There was a pause, in which O turned and rested her wavering eyes on Mhumhi and Kutta. “I am happy,” she said, though her face didn’t reflect it very much. Mhumhi felt that same sense of shame again. He shook himself a little. “To an extent, yes,” said Henli. O was already marching stiff-legged towards the door. “What are you going to look for?” Mhumhi asked, as Kutta hopped from the couch to the table and down on the floor. Tareq was scrambling after her on his hands and knees, knocking the bowls on the tables astray. Mhumhi kept his mouth shut, because if he had said anything it would have been that Kebero had cast his lot in with the wrong dog and it was his own fault, but he knew that was too harsh, and Kutta did too, which was why she was now giving him a sharp yellow look. “This way,” called O, opening the door. It bumped into something solid- a screamer. They scattered away through the hall, hooting and slouching. It seemed they’d all been clustered around the door. “Nice yellers,” said Tareq, in a happy way, and he left Kutta’s side to reach out for the nearest one, a female. She knelt down and put her arms around him at once. O passed through them, seemingly oblivious to their existence, and they parted way for her. O only gave a wispy laugh. “The computers are in this room,” she said, pushing open a glass door. Kutta and Tareq caught up with them, though he noted that Henli had chosen to stay alone in the room with all the couches. They went into the computer room and Mhumhi was at once struck by the similarity it had to the place Mini had taken him to in the building with the yellow stripes. If on a slightly smaller scale- there were only two rows of large monitors here, with thick bundles of cable tied together with plastic tangling together under the tables and down through the floor. O sat down in a chair with wheels on it and rolled herself to the nearest monitor. “Oldtown,” said Kutta at once. She came and sat on the floor besides Mhumhi, tilting her head back to try and get a good view of the monitor. O looked at her, then pressed a button. There was a grinding sound from the ceiling, and Kutta jumped back to her feet. A large, thin sheet of some sort was sliding down like a cosmic tongue in front of them, stopping when it nearly touched the floor. “What-” began Mhumhi, then bristled, for the tongue flickered blue and then suddenly there was an image on it- a primally familiar image, of shabby stucco houses squashed together on a dusty street. “Drain street,” Mhumhi supplied. He stared at the image. Nothing was moving in it- the street was bare. If it hadn’t been for a little dust blowing in the wind in the corner he would have thought it was a still picture. O gave a few blinks, then turned and clicked away on the buttons in front of the monitor. Mhumhi glanced back at the glass door, which O had propped open- the screamers were again clustered outside, evidently aware that they were not allowed in. The same female was holding Tareq in her arms. O obliged, flicking through street after street- there was Food Strip Street, there was the alley with the blue dumpsters with the rusty stain, there was the place where the little bridge ran over the entrance to the sewer- the manhole cover on top was still shifted open- there was the school with its dirty playground, there was Wide Street, all parked cars, swaying, flickering street lights on wires… but no dogs at all. The dispensary stood closed and silent. O obliged, paging back slowly. There it was- a large, dark shape moving slowly down one street. Mhumhi stared. It was a hyena, limping, its movements painful, one ear missing. They watched in silence as it hulked its way down the street, pausing to sniff now and then. It opened its mouth, but no sound was transmitted to them from the cameras. Mhumhi could guess the noise it was making, though. “That’s not a dog, is it,” said O, peering. “Mm,” said O, perhaps in agreement, though he couldn’t tell. She jabbed at the button. Mhumhi kept recognizing the sights that passed by. The old diner with the heavy trash can lying on its side out front- the parking garage where he and Kutta had once leapt over turnstiles- the high monorail that the train ran on- and here was the rest of the city, the buildings getting higher away from Oldtown- streets and streets and streets, empty, empty, except for a sudden flash of that giant square image of a grinning hulker, staring directly at the camera. “Go away from this street,” Kutta urged. Mhumhi’s eyes slid over the image and spotted the entrance to the store where his mother had died before O changed the view. A few more streets down, they finally saw dogs. Painted dogs, to be precise, in a small group, between tall, shimmering black buildings. They too were moving slowly, though it seemed to be with much more purpose than the hyena. Their mouths were moving, frustratingly soundlessly. Mhumhi had the dim thought that he might recognize one- Nzui or Ligwami or Umenzi- but they were all strangers to him. It made sense, of course- there were a lot of painted dogs he did not know in the city. The dogs seemed to be patrolling up and down the street, as they watched, pacing as a small pack up and down from an area just out of the camera’s view. Suddenly there seemed to be a bit of excitement, for more dogs appeared, greeting the others. Mhumhi gazed at them as they wagged and licked at one another, feeling odd- the dogs would never know that someone had been watching them all this time. More dogs came on camera, and then beside him Kutta gave a little grunt of surprise. In the midst of the mass of dogs were two cringing hyenas with bloody faces. The dogs swirled around them, jumping to nip at their flanks so that they ran forward a few steps at a time- driving them, Mhumhi realized. He looked again at the tall black buildings, and recognized them. “Why don’t they just kill them?” Kutta muttered, her brow wrinkling as she watched. Kutta, watching the hyenas, swallowed. 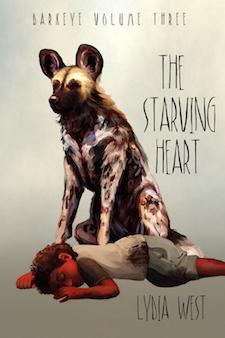 They were tracking blood on the street, even as the painted dogs drove them forward. Mhumhi could now glimpse that some of the dogs were wounded as well, though only slightly. They had come out of the fray better-off. He found he did not know what to feel. It had not been a fight where he’d been cheering for either side to win. The last painted dog’s white-tipped tail vanished from sight at the top of the screen, and then a dark shape emerged near the bottom. The hyena looked around, then loped forward in a kind of zigzag, keeping to the shadows of the building. Kutta stood up in her urgency. “Maybe,” said Mhumhi, staring at what he could make out of the hyena’s face. The eyes were blank and black. It slowed down, lowered its head, and opened its mouth- and whooped. Both Mhumhi and Kutta jumped, trembling, bristling, and O spun around in her chair, her eyes wide. The screamers were uttering little shrieks of alarm, the female holding Tareq cuddling him close to herself. The whoop had not come from the monitor. It was much closer than that- within the building. Mhumhi looked at Kutta, and found that the startled fear in her eyes mirrored his own, because when the second whoop came they knew for sure that they recognized that voice. “so I doubt they’d have similar- er- pathos issue.” issues, or a similar?